In real life, Cami and I saw the trailer for this holiday’s live-action Alivn and The Chipmunks movie in front of The Simpsons Movie. When it was over, the audience audibly groaned with such displeasure, it was like someone told them they would be audited after that evenings cinematic offering. I don’t know if a great deal of outrage is needed to convince you that what transpires in the trailer is the absolute WRONG way to relaunch a franchise. Watch it and be amazed. It’s true – Alvin really does eat a chunk of chipmunk droppings and it’s not gross-funny. It’s just plain gross. The movie is for children, for crying out loud! Do you know any children who are laughing at this? Because if you do, you might want to take them in for a psychological evaluation. They might end up torturing chipmunks in a few years and turn into serial killers not long after that. I hate to sound like a fuddy duddy, but this kind of “entertainment” for our youth has to be doing emotional damage. It’s like someone created some kind of Saturday morning cartoon version of Jackass for the kids! 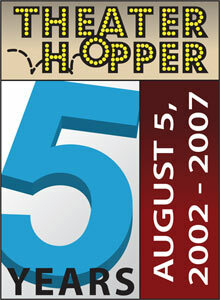 Yesterday, Sunday, August 5, Theater Hopper crossed an important milestone. We celebrated our 5 year anniversary! I know that in the grand scheme of things, a mildly popular web comic that has stuck it out for five years isn’t an overwhelming artistic achievement. And I’ve seen several of my web comic brethren shrug off the occassion as just another day. I was tempted to do the same thing because I didn’t want to look like I was tooting my own horn. But the truth of the matter is, by celebrating this anniversary, we’re celebrating you. I think anyone with two brain cells they can rub together know that most artists pursue their art to be recognized by their peers – and I’m no different. So I won’t lie and say that I would be doing the comic whether I had fans or not. Granted, Theater Hopper started as an experiment to help teach me web design. But as more and more people gathered around the site, I became more and more challenged to see what I could do with it. How many more people could I turn on to my work? How could I get my voice out there? You guys have done a lot of the legwork for me by continuing to spread the word about Theater Hopper. Telling your movie-loving friends about us. Sharing links on web sites and community forums telling people “Hey! Check this out!” Because of your enthusiasm, I’ve made great friends from all over the world who share my passion for movies, comics and comedy. It’s been an amazing ride so far and I would have never imagined five years ago that this is where Theater Hopper would lead me. So to ignore the occasion? Impossible. Because ignoring the milestone would be ignoring you – and that’s just stupid! I want you guys to spread the word about this awesome opportunity. If you have a MySpace page, a Facebook listing, a LiveJournal page, a tall cliff and a megaphone – WHATEVER! I want everyone to know about this awesome, once-in-a-lifetime chance to snag over 400 pages of content in full-color with complete commentary you won’t get anywhere else! If you’ve been sitting on your hands waiting to pick up these books, NOW IS THE TIME TO DO IT! If you want to get a little early holiday shopping done, pick up these books now and squirrel them away until December because it’ll never happen again! Please keep in mind that this offer is not available for our books and t-shirt bundles. This offer is exclusive to books only. My goal is to move as many books as I can as quickly as I can in hopes of raising funds to start production on Theater Hopper – Year Three. Remember, this sale lasts for five days only – from now until Friday, August 10. Once it’s over, prices go back to normal. So order today and THANK YOU for your support! I couldn’t have made it five years without you!